Mountain bike & downhill gloves are a very important part of any downhill cycling attire. Without gloves, you will not get the right traction, your hands will blister and any fall can lead to serious abrasions. As opposed to traditional cycling gloves and half-finger MTB gloves, downhill gloves usually have long finders and are made using robust materials. The Shimano, Roeckl or Qloom ranges offer bikers a huge selection of varied models and their matching knee pads and shin guards. A pair of downhill gloves will not last many mountain bikers a whole year. They need breathable gloves in the summer, but the winter requires a lightweight lining. Waterproof and wind repellent gloves with a Gore-Tex Membrane will make the ride that much more comfortable, especially in the colder times of year. The most important criterion for the perfect downhill gloves is the perfect fit. The fingers must be the right length and the glove should never slide around or dig into your hands. That is the only way to get the best possible traction on the handlebar. Biking gloves are not presented with the same challenges when used every day as they are with downhill rides. That is why these are made of sturdy materials and feature additional reinforcements at hard-wearing points. 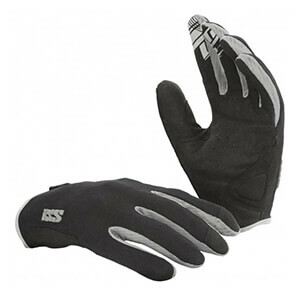 This increases the product life and the biker can use the gloves for that much longer. That is why leather as well as synthetic leather and diverse synthetic fibres like Nylon or polyester are combined. Special silicone pads or foam absorb excessive shock and knocks to prevent your hands and wrists from tiring out mid-trail. Downhill cycling presents much more risk of falling compared to other forms of biking, so these reinforcements on the downhill gloves are sometimes also additionally padded or fitted with plastic caps on the fingers or knuckles. This kind of knuckle protection can prevent you breaking your hand or fingers when you fall at a higher speed.